Pacific Rim met and shattered my expectations. Initially, after seeing the trailer for the first time, I remember feeling disappointed once giant robots showed up. I have a deep ambivalence to giant robots. They are the reason why I will never watch Neon Genesis Evangelion, although I have received multiple lectures on why it is one of the greatest anime ever. But I love monsters, and armored female characters with cool hair, and dramatic speeches performed by Idris Elba. The more I learned about the movie and Guillermo del Toro’s intentions while making it, the more interested I was in seeing it. Del Toro addressed basically every fear I had about the movie. What I love most about these comments is that del Toro was successful in his goals. He avoided the perils of “army recruitment video aesthetics” (which, by the way, is my new favorite phrase). He featured a complex female character who, although she was unfortunately the only major female character, was also the most interesting character. Period. There has been some undeserved criticism about the character of Mako Mori. Despite the fact that Raleigh the Typical White Guy was ostensibly the main character of the film, Mako Mori was not just the film’s emotional heart, but also the most developed character. Mako is afraid and vulnerable, but wants to pilot anyway. She faces and overcomes fear and weakness, which is the true meaning of bravery, not swaggering unthinkingly into danger. There were times I wished that we let Mako comment on the events instead of Raleigh, and I don’t think she got equal screen time during the end’s triumphant battle. Those are legitimate issues. When thinking of the role of women in the film, it’s unfair to criticize the characterization of Mako. What the film really needed was more female characters, not a single “perfect” female character. This is one of the many problems that arise when a movie only has one central female character: people burden her with the weight of representing a “strong female character.” As other bloggers before me have said, I don’t care if fictional women are “strong.” I want them to be interesting, well-written, and three-dimensional. Mako was all of these things. It is very easy to read the film’s emotional conflicts as showing the negative effects of barring women from traditionally male pursuits. While the given reason why Mako isn’t allowed to pilot is that she is Pentecost’s adopted child, it is hard to believe that Pentecost would prevent his adopted son, especially when he has quantifiable talent, from piloting. It is never explicitly addressed, but there is only one other female Jaeger pilot, and the candidates for the job as Raleigh’s co-pilot, all male, clearly underestimate Mako’s abilities in a physical fight. She proves herself, as so many of us do, only to be shut down unfairly by a paternalistic figure. Ultimately, Mako’s persistence pays off, and she and her super-buddy Raleigh save the day. 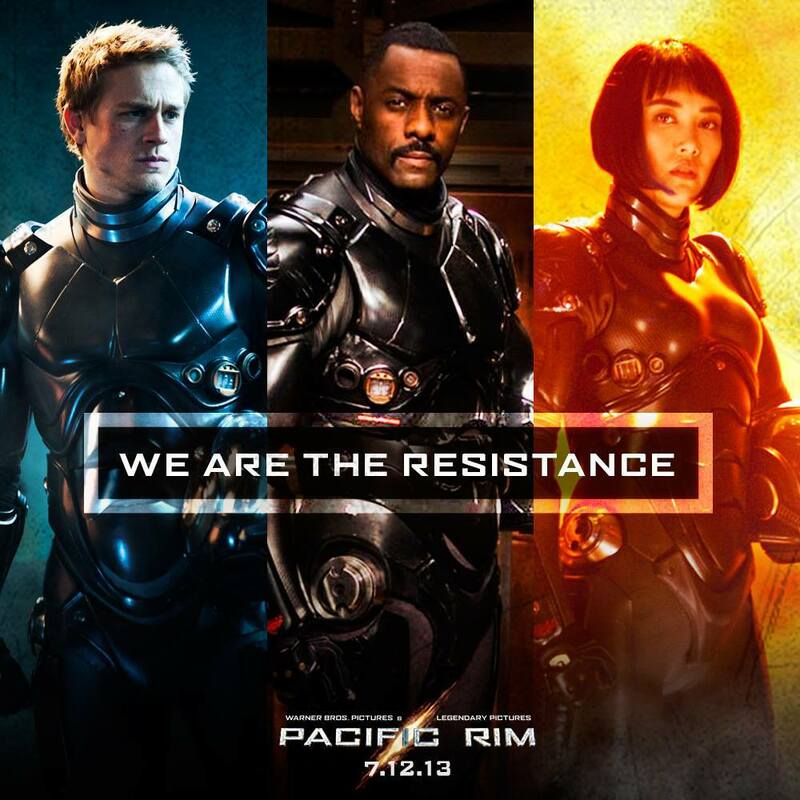 Far from having a “woman problem,” Pacific Rim warns us against the dangers of underestimating women. I would even go so far as to argue that, after meeting Mako, Raleigh functions mostly to assist Mako on her journey to personal growth, reversing the typical character trajectory that features the token woman functioning to support the male protagonist. The fact that Mako and Raleigh have such a deep, platonic emotional connection is also commendable and practically unimaginable in most movies. I haven’t even mentioned Idris Elba yet. Idris Elba brought nuance and depth to Stacker Pentecost, a character who otherwise might have alternately bored and infuriated me. Had the role gone to Tom Cruise, as it almost did, I think I would have disliked Pentecost’s controlling nature, his fear of Mako’s power. But as Idris Elba, Pentecost became complex and loveable, a man who I wanted to respect with Mako’s intensity. Although the importance of the father figure is one of the oldest tropes in fiction, it should be noted that black men rarely get to be fatherly in movies. The complexity of both Pentecost’s love for his adopted daughter and her love for him is remarkable in itself, partly because the reasons behind it are explored at all. In general, when a character has a conflict with her or his father, it is taken as a given that this person would want to love and respect her or his father. Fathers deserve these things because they are fathers. But Pacific Rim acknowledges the complexity of paternalistic attitudes, rather than suggesting that all fathers inspire love and respect simply by being fathers. Pentecost has earned Mako’s respect, a feeling she pointedly distinguishes from obedience. Furthermore, sometimes Pentecost’s paternalism is harmful, resulting in him preventing her from being the pilot she is qualified to be, because he wants to protect her. While Pacific Rim may seem to be yet another blockbuster about various things smashing each other, it would be unfair to dismiss it as such. It may not have been perfect, but for me the depth of the characters was the true heart of the movie, a judgment I usually don’t make on summer blockbusters. While del Toro may insist that the movie is not a homage to anime or monster movies (Japanese or otherwise), he did take a variety of genre tropes and breathe life into them, giving us the kind of monster movie all monster movies should be.